HomeGeneralDays Fest and Farah Fath! Days Fest and Farah Fath! We spent this weekend in Salem, Illinois, attending the 2003 Salem Days Fest. Salem Days Fest is one of three officially sanctioned Days of our Lives fan events. And yes, I do watch the show…. Not every episode, but Kristin TiVos them, and either I watch them with her, or she updates me on what I might have missed. Anyway, there are Q&A sessions, autograph signings, and ticketed events with the guests from the show. 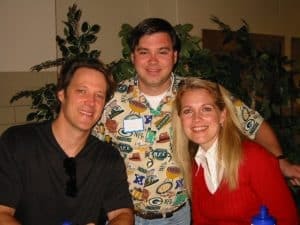 This year’s guests were Matthew Ashford (Jack Devereaux), Missy Reeves (Jennifer Horton Devereaux), Jim Reynolds (Abe Carver), Valerie Wildman (Fay Walker), Eric Winter (Rex), Alexis Thorpe (Cassie), and Farah Fath (Mimi Lockhart). Farah was the person I was most interested in seeing. Here we are at the autograph signing. When it was my turn in line, she looked at me, said I looked familiar, and asked if I was at the event the previous year. I had to admit I hadn’t, but hey, Farah thought I looked familiar! That has to count for something, right? We also went to the brunch with Matt and Missy this morning. The brunch was great, as both Matt and Missy spent a lot of time taking questions. Matt looked like he had a long night, but Missy seemed every bit as perky as her character Jennifer. Missy is so cute….